As a 20 something, 90% of my time is spent on finding something to watch on streaming websites and relating the content with my work. While being in the entertainment business does make it a part of my job, seldom do I watch something just to relax and enjoy. During one of these scouting sessions on Netflix, I came across something so beautiful and revolutionary that it triumphed over all my weekend watches and tops my ‘must watch and recommend list’. 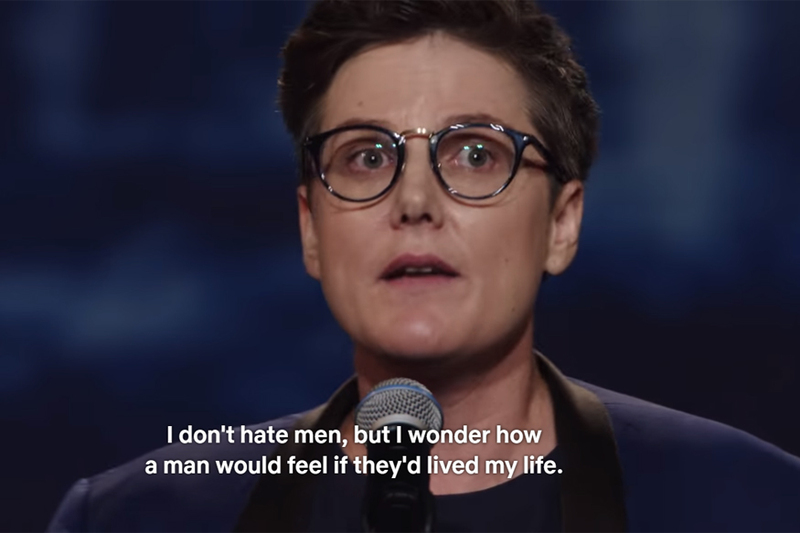 It would be wrong to call Hannah Gadsby’s Nanette just another stand up special available on Netflix. It is 69 minutes of pure revelation and something so plain yet extraordinary that you can’t help but wonder about things you always knew existed but with a new perspective. 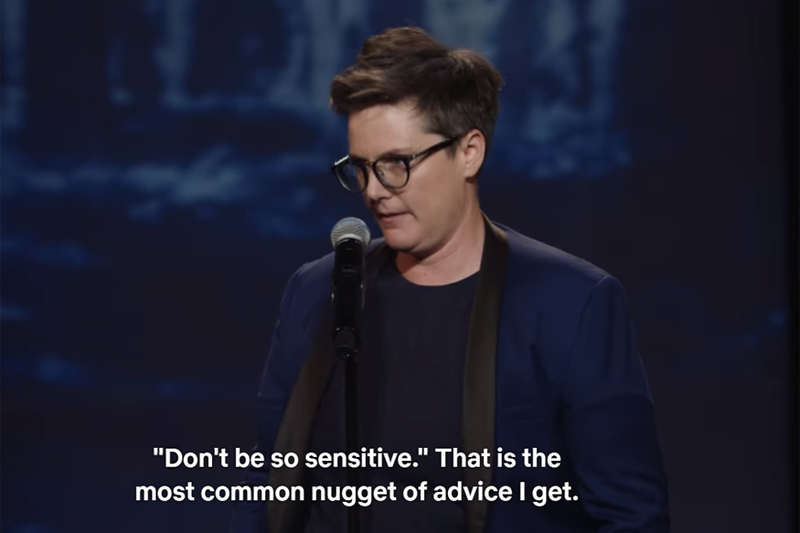 Hannah Gadsby has been a prominent name in the field of stand-up comedy for over a decade now. The Australian female comic, famous for bringing ‘lesbian comedy’ on the forefront, hails from a small town Smithton in Tasmania. Now coming out of the closet in the late 90s in a town which believed homosexuality was a sin, took a toll on Hannah’s personality formation and to deal with the trauma, the comedian channelized it into a story packed with jokes and started presenting it to her audience. 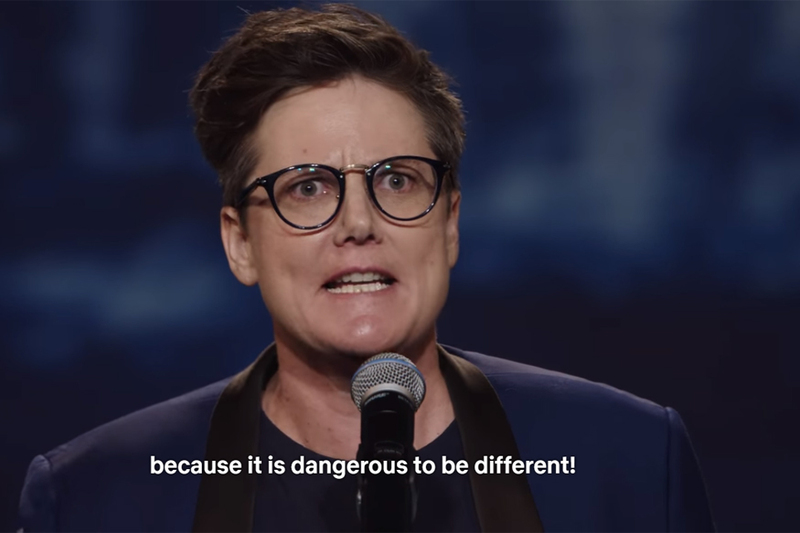 But Nanette is a compilation of her observations made after a decade of disguising her pain and anguish with comedy and how she feels making a joke about her trauma is not her way to go in life anymore. The most unconventional thing that happens in Nanette is that the comedian cancels her will to be funny or make the audience laugh at her misery. Instead, she becomes angry. She is angry about thing every homosexual person is about. She becomes angry about things every woman around the world is about. She becomes angry at white-male privileges, patriarchy, people’s entitlement towards her own life and becomes real about fighting with trauma that formed her personality. She begins her special by attacking the idea of fitting in a label. “The pressure on my people to express our identity and pride through a metaphor of party is intense.” The line stays with you. Exactly, where are the quite gays supposed to go? Why is it that a person needs to rally around, celebrating their identity when all they need to do is exist. While this sentiment might resonate with a larger block of people in the west, in India, the pride ‘parade’ is still just a ‘parade’. A country which still has to understand and legally allow the LGBTQI people to come out in open without fearing snares, remarks and even lawful banishment, Hannah’s sentiments echo in blank space. The ‘fit in the box’ segment just doesn’t end there. She also questions the categorising of little babies into gender, separating them into the pink and blue baskets. A solution from Gadsby not only makes you think about gender norms and confirmations but also how this might be the way to help young minds consider their own identity in a less hostile environment. A society where one is not forced to pick between pink and blue but from a varied array of colours, if and when the child pleases. A choice is all that is needed instead of forced characterisation. Gender needs to be fluid and Gadsby stands by it. Her entire piece on the patriarchy and gender equality is something that’ll leave an indelible impact. The way this Art History graduate takes the case of Picasso and shreds his idea of ‘beauty and life’ as a male privilege reeking of entitlement is interesting. Picasso believed in looking at things from different perspective, however, he deemed himself to be the judge of all those perspective. The case is somewhat similar to the ‘so-called woke’ men in our lives who are woke enough to understand the dynamics of a changing society but still pool in the ‘Not All Men’ club, still trying to assert their ‘superior privileges’ on women and other gender. The male entitlement of allowing a woman to speak in a gathering of men and then seeing as a pride of their own progressiveness is faulty to the core. The opinion is for all the women who are branded men-hater and angry for just stating facts about gender inequality and safety in a ‘progressive woke’ society filled with men who think they still hold the reigns of the other gender’s narrative, pulling it whenever it doesn’t fit their own scheme of things. The key highlight of Nanette is Gadsby talking about mental illness, depression and anxiety. From a person who started her career with self-deprecation, the comedy comes out in the open, revoking her own right to tell her story by looking down at herself and her life. “Do you understand what self-deprecation means when it comes from someone who already exists in the margins? It’s not humility, it’s humiliation” and in her own words, she is done turning her trauma into comedy. Laughter is not the best medicine when the laughs are being evoked by turning your tragedy into jokes. It’s a call for help, not many people see. Comedy is not a story, jokes never have an end, it’s always the beginning and middle that entice the audience because as soon as the end approaches it turns into comedian’s nightmare. Nanette makes sure that Gadsby tells her story and not just jokes. It gives her the platform to tell the end of her decade-long surviving joke about her identity as a lesbian, as a woman making it in a man’s world, as a human being tired of privileged entitlements and a comedian sick of making celebrities out of her jokes, unable to internalise her own memories and feelings the way they actually exist. “You learn from the part of the story you focus on,” says Gasby and Nanette gives you over one hour of the tour into the world we are living in and the stories that are actually happening around us. It’s our turn to stop, assess, think, re-think and pick our own narrative, relate to it, support it or critique it but in our own way. 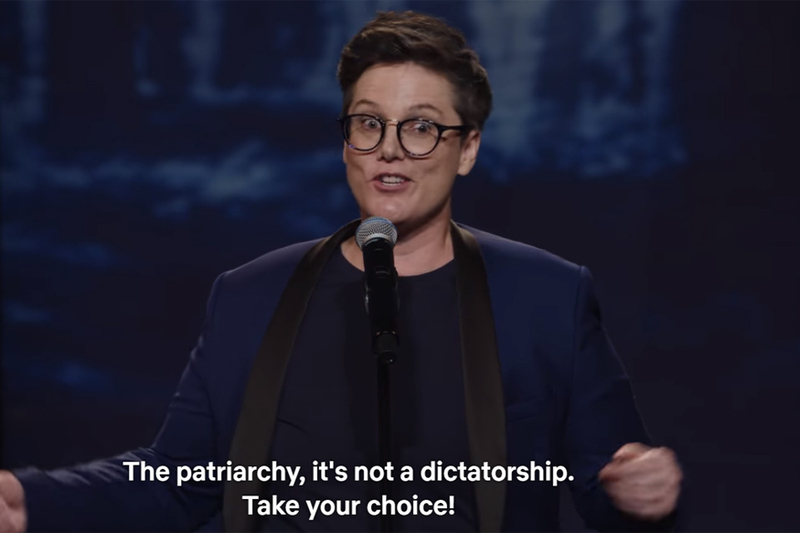 Hannah Gadsby’s Nanette is full of rage, humility, and personal observations. It’s an unapologetic, gut-wrenching class about the culture that exists right now, that one must attend. This is radicle comedy that will leave you as a changed person. It leaves you shaken, to say the least.